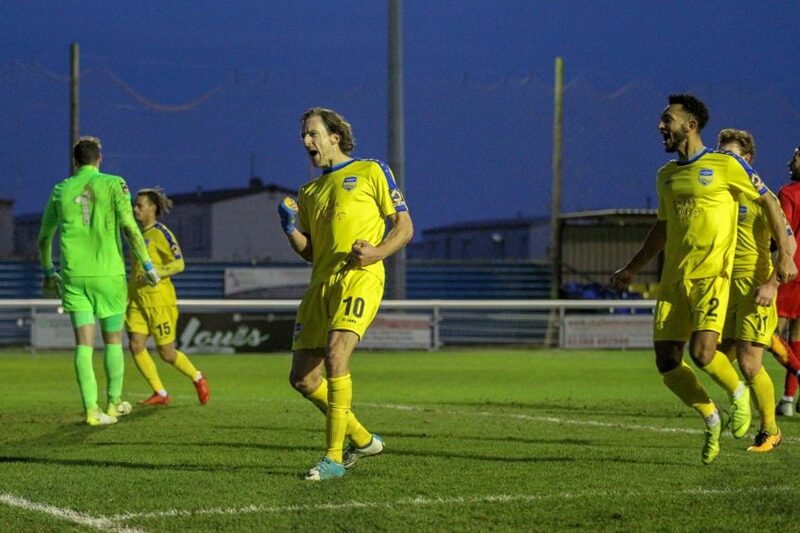 Billericay Town’s trip to Canvey Island ended in a 2-2 draw at Concord Rangers. The home side secured a point from a late Jack Midson penalty. Early dominance from the Beachboys saw them lead through an Alex Wall header before the Blues struck back with a fierce Connor Smith shot. Both sides saw red and were each down to 10 men in the second half. 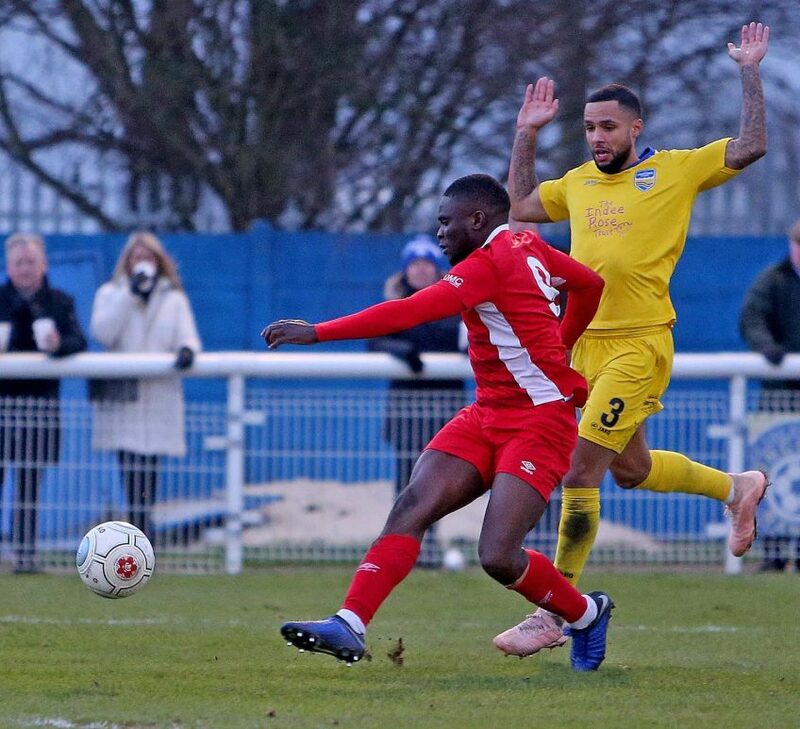 Moses Emmanuel drove home to put Billericay ahead before Concord’s assistant manager stepped up to ensure that honours ended even. On a chilly January afternoon, the copious band of travelling supporters braved the elements to gain their first sight of Jamie O’Hara in his new role as assistant manager. With incoming boss, Harry Wheeler, unavailable to take the team until Monday, O’Hara would be the main voice from the touchline. Wheeler was present at the game, and mingled with Blues supporters beforehand, to make his re-introduction after the 147 day interlude since his last game in charge at Chippenham. Billericay’s line-up included four changes from Dean Brennan’s last League game the previous Saturday. With a switch to a 3-5-2 formation (from 4-3-3), the influence of Wheeler was clear. Back, after injury, came Paul Rooney, and, on debut, Millwall U-23 loanee, Jesse Debrah, both starting within a back three marshalled by Joe Kizzi. Calaum Jahraldo-Martin came in at left wing back as Jake Howells moved to midfield. Fan favourite, Alan Julian, returned in goal in place of Mark Smith. Concord also tweaked their line-up after the home draw against Wealdstone the previous Saturday. Looking to exploit Billericay’s defensive vulnerabilities, manager Sammy Moore elected to bring width and crossing capability into the team with wingers Danny Green and Joe Gardner preferred to midfielder Ahmed Abdullah and the young Millwall U-23 loanee striker, Lewis White. With centre-back Tyrell Sterling absent injured, Aron Pollock came into the side to cover his defensive duties. After some early breaks forward from Billericay’s Coombes were snuffed out by the Concord back-line, the home side opened the scoring in the fourth minute. Faithful to the Moore strategy of getting the ball forward quickly and into the danger area, Frazer Shaw worked space intelligently on the left hand side. His pinpoint cross was nodded home from close range by the unmarked, Wall, who scored his 14th league goal of the season. 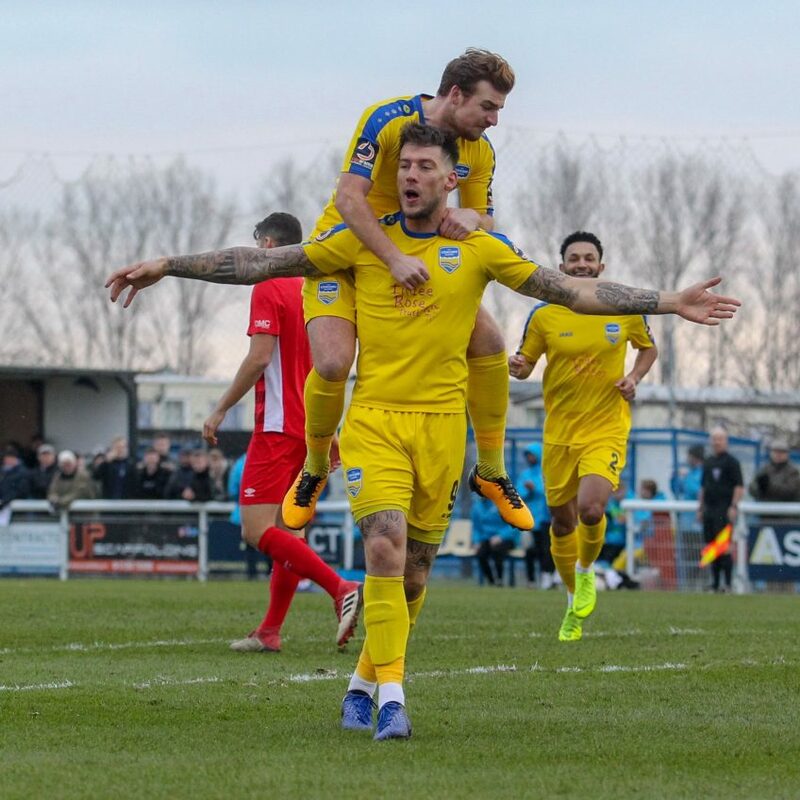 One of Concord’s many summer changes, the striker actually signed a deal to be at Dartford this season but was surprisingly released to become a Beachboy last August and is enjoying one of his best ever goal scoring campaigns. With significant personnel and formation changes, Billericay had some trouble in working themselves into the game in the early exchanges. A ball forward out of defence, which saw the Blues’ Jahroldo-Martin beat his man on the left and advance into the Concord penalty area before the move petered out was the only moment of note. Concord continued to threaten most as a rising right foot shot from Gardner sailed over the bar. Midson’s movement and aerial prowess asked continual questions of an inexperienced back-line playing together for the first time. Chasing a forward pass, the Concord forward was just beaten to the ball by an alert Julian, who cleared sharply for a corner, colliding with the onrushing striker on his follow through. Billericay’s best work was coming through right wing back, Michee Efete, who showed a willingness to get forward. He recorded the Blues’ first shot on target on 19 minutes, which was comfortably saved by the home goalkeeper, Sam Beasant. It would be Julian in the Billericay goal who would have to distinguish himself with a remarkable save from the ever-present Midson. Concord’s striking duo combined smartly as Wall turned provider, with a cross from the left hand side. Met on 21 minutes by Midson powerfully with his head, Julian’s quick reaction to produce a diving save to his left was outstanding. Concord continued to test the Billericay defence with Green a ready supply line of quality delivery from the right hand side. On the back foot as Concord pressed, and seeking to counter with balls gobbled up by the Concord defence, Billericay came under sustained pressure during the first 35 minutes. Jake Howells, named as skipper for the away side, set an example as captain with his constant harrying of the opposition, excellent positional sense to head away dangerous balls on many occasions, and direction of less experienced team-mates. Ever an outlet, Coombes also toiled hard, always showing for the ball. And suddenly it all changed in the 36th minute as, out of the blue, Billericay hauled themselves level. In space, just over 30 yards from goal in a central area, midfielder, Smith, smashed a wonder-strike past a bemused Beasant. Clearly expecting the shot to clear the crossbar, the Concord goalkeeper remained rooted to the spot as the ball dipped, hit the underside of the crossbar, and nestled in the far corner of the net to restore parity against the run of play. In a match that was fully committed, as one would expect for a big derby fixture, but never dirty, cards began to accumulate. The referee applied the letter of the law equally to both sides but was on the strict side. 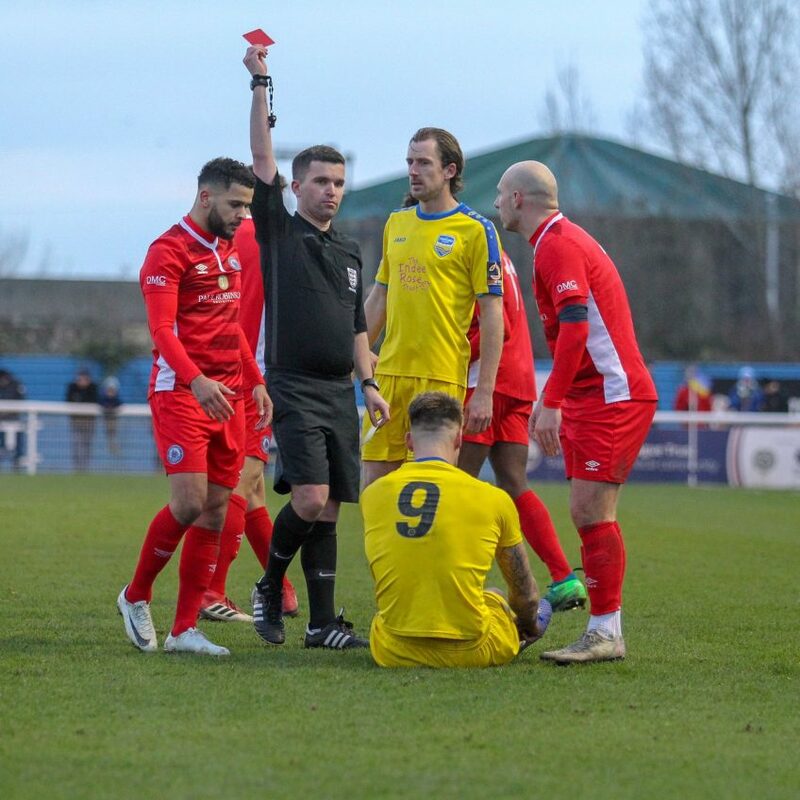 In his first competitive men’s match, Billericay’s Debrah had a debut to forget as he was booked twice in the space of three minutes to leave the Blues one man short after 52 minutes. This advantage would only last 5 minutes as Concord’s Wall saw red after also receiving a second yellow card as he was adjudged to have dived to earn a free kick. After a needless earlier booking for fouling Julian, and putting the ball into the net, it was to prove a frustrating leveller of the odds for the Concord fans. Wall only returned to the side last week after a three match ban for a red card at home to Chippenham Town. It got worse for the Beachboys as Billericay took the lead through a 59th minute strike from Emmanuel. Played in by his strike partner, Coombes, the wily front man, in space 12 yards out, hit his shot hard and early to catch out Beasant at his near post. 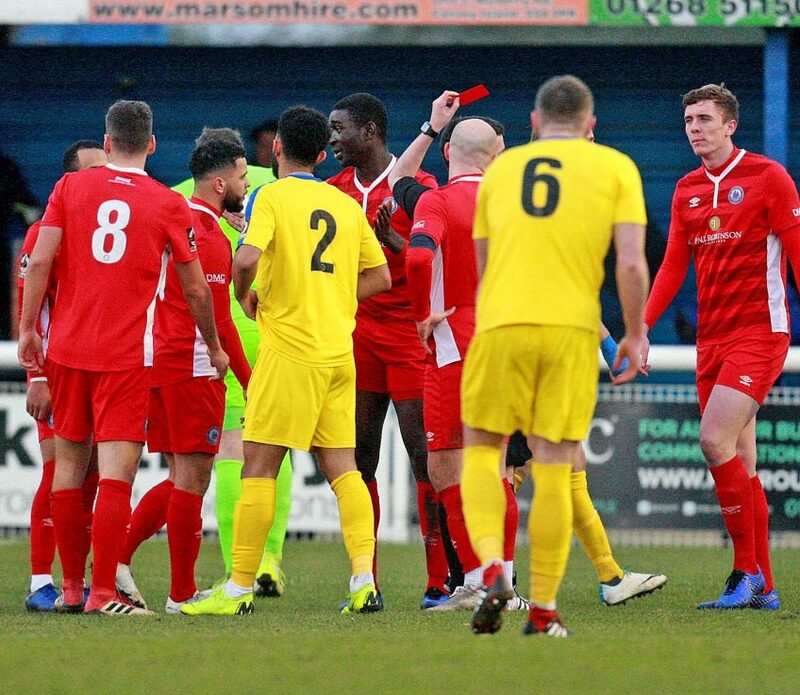 Visibly buoyed by the earlier sending off of Wall, Billericay came back into the game and, as the match progressed, looked to be surer at the back, with Rooney winning important headers and seeking to pass the ball out of defence. With an advantage secured, Billericay started to absorb rising pressure from Concord with Sam Blackman providing an immediate response. His vicious, dipping shot on the hour forced another diving stop from Julian. Entering for Gardner, 19 year old White was a lively presence for Concord and, with his pace, provided a spark to the home side’s attacks. With the departed Liam Nash, previously on loan from Gillingham, contributing with a number of goals, Lewis has big shoes to fill. Although he offers something very different to the more experienced Nash’s more direct style, he looks capable of giving his manager a different and viable attacking option. With the home side building up a head of steam in search of an equaliser, Julian again excelled for Billericay. A fingertip save from a Danny Green free-kick and willingness to command his area to come to take high balls into the box to relieve pressure on the defence were contributions of note. He could do nothing but stand and watch with relief on 76 minutes as Midson went close. 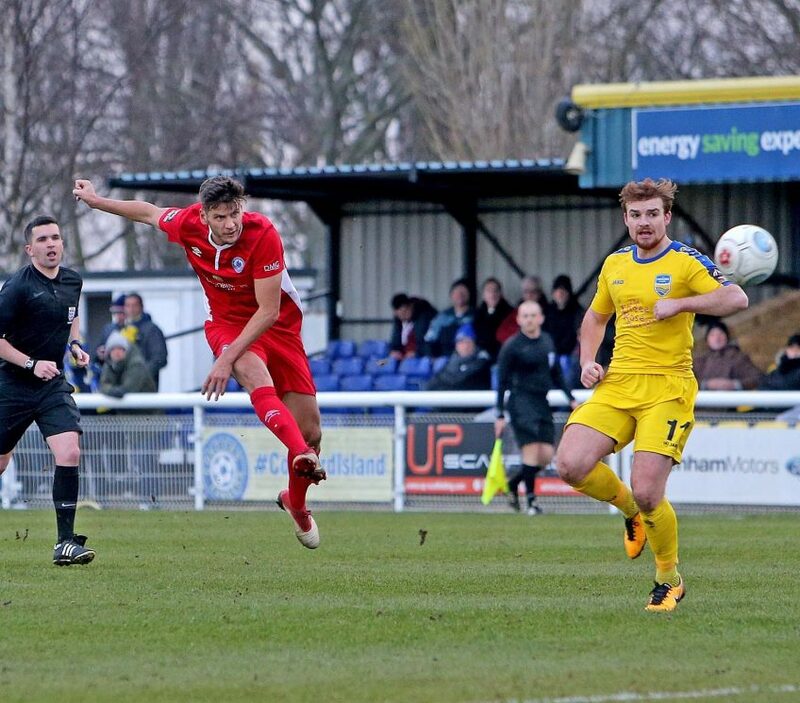 A corner routine from Concord saw the experienced striker peel to the near post and glance a powerful header inches wide of the opposite corner in a big let-off for Billericay. After the concession of an early goal, Billericay’s defence looked like holding firm. Rooney and Kizzi appeared comfortable in the centre back positions and were well supported by Efete moving across after the departure of Debrah. With Emmanuel left alone up front, and Kieron Cadogan trying to break from midfield to support, a significant win looked to be just the morale booster that the club needed after a difficult week. It was not to be as an adjudged foul by Rooney on Concord’s central defender, Lee Minshull, yielded a very questionable penalty decision. Midson stepped up and, in the 94th minute, slammed a nerveless spot-kick past Julian to secure the draw. Connor Essam almost won it for the Beahboys with a late incursion that saw an effort past just over the bar. In the end, a draw was probably a fair result and a point on the road at Concord represents an encouraging start for the new Blues management. 1.Sam Beasant 2. Tosan Popo 3. Frazer Shaw 4. Connor Essam 5 Lee Minshull 6. Aron Pollock (14. Ahmed Abdullah, ’75)7. Danny Green 9. Alex Wall 10. Jack Midson 11. Sam Blackman 12. Joe Gardner (15. Lewis White, ’57). Subs Not Used: 8. Sammy Moore 16. Louie Hunt 17. Kiah Froud. Alan Julian: Superb save in the first half from Midson header was one of the best Alan has produced and stopped team falling 2-0 down. Commanding in his area to take high balls to relieve pressure in second half and announced his return to the side with a compelling performance. Jack Midson: A busy performance at the centre of all things that Concord produced and unlucky not to score from open play. A team player who also drops back to do a lot of the hard graft, he kept his nerve with a late penalty to secure the draw.